Nagaland was among the top five states and UTs which were awarded for excellent performance in Beti Bacha Beti Padhao (BBBP) scheme under state competition category. 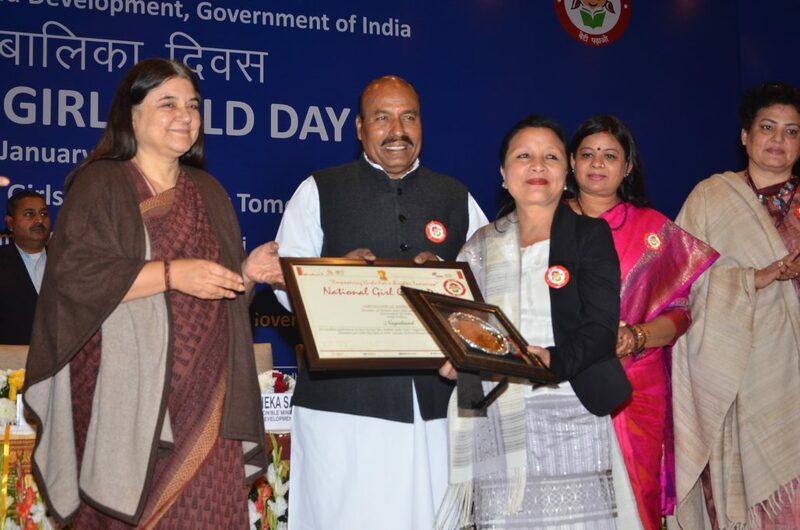 Secretary, social welfare department, Sarah R. Ritse received the award from Union Minister of Women and Child Development Maneka Gandhi on behalf of Nagaland during the National Girl Child Day celebration in New Delhi on Thursday. The award was given in recognition of excellent performance in overall support, guidance, monitoring and achieving the targets of BBBP scheme. This is for the first time that states and UTs were awarded for their good performance under BBBP. Speaking at the award ceremony, Ritse appreciated the team work of the State Resource Centre for Women (SRCW), the nodal agency of Nagaland State Social Welfare Board under social welfare department, as the implementing agency of BBBP. She said the award was a result of the support extended to SRCW team by Nagaland Governor, Chief Minister, chief secretary and the whole community. Ritse hoped that the award would be a morale booster not only for the department but also for the State to work harder for the uplift of our women and children. The SRCW’s role as the project management unit is to implement the state-level activities of BBBP scheme and provide overall guidance and support to all the district administrations implementing it. The Wokha district administration has also been awarded amongst 25 districts in the country for its good performance in BBBP scheme in “Effective Community Engagement”category. Wokha deputy commissioner Manazir Jeelani Samoon received the award on behalf of the district.